myrrhmalade: Replacing "Sorry" with "Thank You"
While it circulated a couple years ago and before as well, it was a fresh idea for me. The idea is that instead of saying "Sorry for being late" you say "Thank you for waiting" or "Thank you for your patience." Instead of apologizing for the state of your home (because, you know, actual people live there) you can express gratitude for having understanding guests. Instead of lowering or debasing ourselves (often for just being human) we can elevate those around us. This isn't to say there aren't times that call for genuine apologies. Often these little social "sorry"s are a way of covering over our own insecurities about the gap between how we think we should live and how we actually do. Thank you for being here. Thank you for waiting. Thank you for showing up for me. Thank you for being so understanding when I lose my cool. Thanks for being marvelous when I wasn't at my best. Thanks for picking up my slack, I'll do my best help you up when you stumble too. Appreciation and gratitude not only affirm and boost those around us, giving them also positively affects the giver. If we are in a place to thank someone, we have received something. Instead of something lacking or being wrong with ourselves, we can highlight the good around us. Each and everyone of us can find things to be grateful for, and ways to express that gratitude. Let's make the world a more lovely, connected place, together. We all know, on some deep level, that it's our connections with other people that make life great. There are so many people suffering without those connections, contacts, or even enough positive interaction with those they do have. Little shifts such as these can truly change the world. And goodness knows, we could use a little right now. Just the other day I was thinking along these same lines. So it was nice to come across your post! People (especially women?) often apologize when they really haven't done anything wrong. If what's going on is just the ordinary events and exigencies of life, no apology is really needed, is it? As you say, just a thank-you for others' patience, understanding, good humor, and good work. Plus, saying "I'm sorry" when you really haven't done anything wrong often makes people feel uncomfortable, and requires them to engage in awkward "make-up" comments. But saying "Thank you" makes people feel appreciated (because they are!) and strengthens the relationship. And yes, of course, if we've actually done something wrong and hurtful, then it's time for an apology! Thanks for your thoughtful thoughts! thanks so much for your well written comment! I appreciate your insights and eloquence! 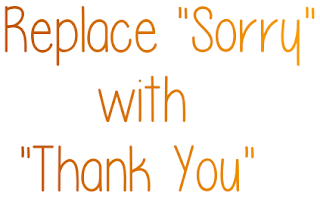 I absolutely agree that apologizing unnecessarily can make others uncomfortable! Lowering ourselves doesn't make others feel better. Raising others can make everyone feel better. And who couldn't use a little more (given and received) gratitude!